The Mersey Gateway is currently the largest new build bridge project to take place in the North West of England. During the first 6 months of 2015, Ridgeway worked closely with the project’s Senior Engineers supplying the 4T filter unit for scour protection of the North Cofferdam and later the Central Cofferdam. The Mersey Estuary presents very challenging tidal conditions that can affect the foundations of any new structure being erected in its straits; this was certainly the case for the Mersey Gateway. 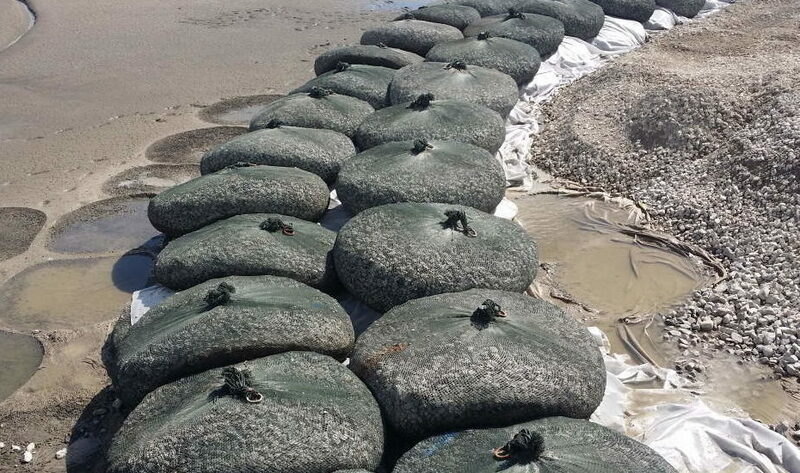 It was realised during the early stages of the Cofferdam installation that scour protection would be required to prevent the removal of material from the edge of each structure. The senior engineers required a scour protection system that could be easily installed and removed after 2-3 years to support the removal of the sheet piling once the bridge foundations were complete. Ridgeway worked tirelessly supporting the senior engineering team providing the filter unit solution and technical onsite advice on initial installation of scour protection for the North Cofferdam. Installation of the filter units commenced in mid April which then progressed onto the Central Cofferdam 1 month later. The engineers were very impressed with the product in terms of its fast preparation and installation rate coupled with the fact that no river bed preparation/levelling was required, making it a very cost effective solution.